Saab 17 Video - World War II video - First flight? Picture - Saab B 17A in Danish colors. 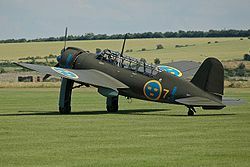 The Saab 17 was a Swedish bomber-reconnaissance aircraft. The project first started at the end of the 1930s as the L 10 by ASJA, but after the merger with SAAB in 1937 it was renamed Saab 17. The wings were reinforced to make it possible to use it as a dive bomber. Since there was a shortage of engines the planes were flown to the destination where the engine was removed and reused for the next delivery. The plane was also made in three versions with different engines. The B 17A used a Swedish built Pratt & Whitney Twin Wasp, the B 17B a British Bristol Mercury XXIV licence-built in Poland, and the B 17C an Italian Piaggio P.XI. The aircraft could be fitted with wheels, skis or floats. A unique feature of the Saab 17 was its use of the extended landing gear assembly, with its large covers, as dive brakes. The first test flight was on 18 May 1940 and first deliveries to Flygvapnet were in 1942. However, the development of jets meant it had a short service history. When the planes ended service in 1947-1950 46 of them were sold to Ethiopia where they were in service until 1968. Two B 17As were sold to Finland. The first one in 1959 and the second in 1960. They served as target tugs in the Finnish Air Force. Both were however soon damaged and removed from service. 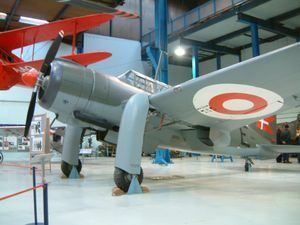 The SAAB 17 had a total production run of 322 aircraft. Jane, Fred T. “The Saab-17.” Jane’s Fighting Aircraft of World War II. London: Studio, 1946. ISBN 1-85170-493-0.